Due out on February 22 in Japan. 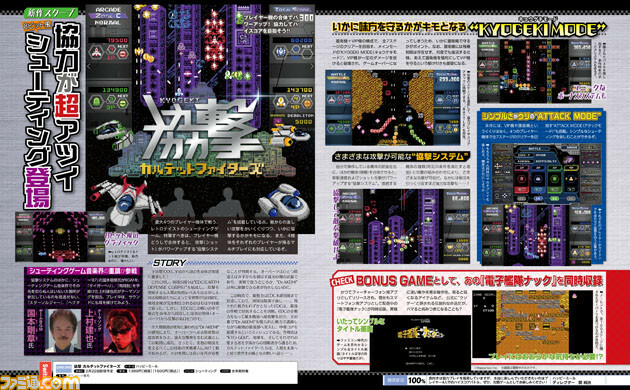 The latest issue of Weekly Famitsu reveals a new, retro-style shoot ’em up game for Switch called Kyogeki Quartet Fighters from developer Happymeal. It will launch via the Nintendo eShop on February 22 in Japan for 1,389 yen. Kyogeki Quartet Fighters will support up to four players at the same time. It uses a “Kyogeki System” that powers up your attacks by combining the aircraft of multiple players. The background music is led by Star Soldier and Milon’s Secret Castle‘s Takeaki Kunimoto, and the theme song by Tiger Heli and Twin Cobra‘s Tatsuya Uemura. Additionally, the game also comes included with the retro-style junk RPG shoot ’em up Denshikantai Knack.